~Chris made some Curtains from tablecloths, and they are fabulous! ~Free Autumn Dessert Flags from Amy. 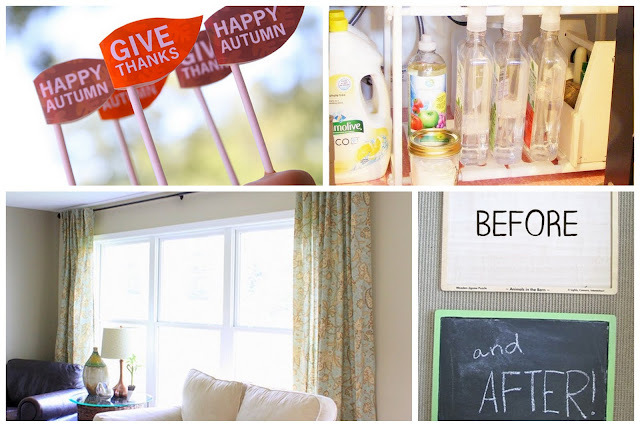 ~Homemade Cleaners that will save you some money! ~Ann Marie shared her Repurposed Melissa and Doug Puzzle Trays. Family Friendly Food Week: coming September 19th! So I guessing you are ready for school to start, huh? LOL! I was excited about school starting too:) I hope you have a great weekend Amanda! I love your "Blogging and Beyond" series! It is great fun to hear other bloggers stories! I so enjoy your blogging series. Thank you for taking the time to post them! Now I'm off to check out some other links! The curtains-from-tablecloth post was one of my favorites this week. So darn smart. I've been looking for extra extra long curtains for our living room and I think this is the most affordable way to go. It has been a crazy week for me so I haven't had much time for blog reading, I love your week recap to catch up! Thank you, as always, for setting up the link party. It is always fun. Thanks for hosting! Looking forward to gettin' my blog reading on! Thanks for hosting! Love your wreath and your features! Have a great weekend! I love the crayon wreath. You can't go wrong with all those gorgeous colors. THanks for hosting. Ahh! That is so funny! The post about tablecloth to curtains - I actually bought the same exact tablecloths (4 of them) about 4+ months ago and turned them into curtains for my house and a shower curtain for the kids bathroom. I love it! I actually posted a picture of the curtain (still in progress) in my post/link up today! How funny! Thanks for hosting! Wow! Looks like some really great stuff linked up! I need to hurry and get something linked up! Thanks for putting this together, it's so fun going through all the links. Amanda, you will get no judgement from me. I was so ready for my boys to go back to school I could practically taste it! I don't remember ever being so ready for them to go back. That will not win me any Mommy of the Year awards but it is the truth. AND we did get sick the 1st week of school....2 days before the first smiffle appeard so best of luck keeping your girls healthy. Thanks for hosting, Amanda. I've been MIA lately, but not because I don't like it here. Totally hear you about being ready for school to start. My post is about just that, actually. Good luck with your weekend. I'm sending "stay healthy" prayers your way :). My boys started this week. My little one is in kindergarten so it was quite an emotional week for me! Thanks for hosting this weekend! i've linked up a post today - am so excited to find another linky party. thanks for much for hosting. look forward to looking around the party and your blog! Amanda, I completely understand about the kids going back to school. You just need a break! But then, in a few days, you'll miss them. Catch 22! 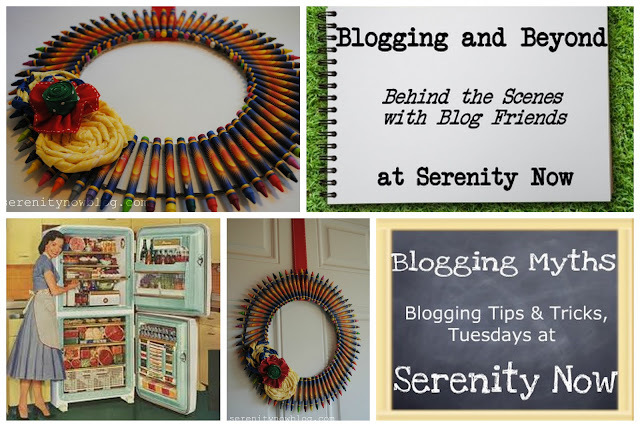 Linking up again to your wonderful Weekend Party. Great features this week. I love those curtains. Gotta make me some. Thanks for hosting again! And YES...fall is in the air here in Nova Scotia too...YESSS!!! Girl, I hear you! I was so ready for school to start, and completely baffled by the moms saying summer went so fast and they're gonna miss their kids all day, yadda yadda yadda... Really? I say school is awesome and learning is awesomer, and time for mommy's batteries to recharge is pretty awesome too! Don't worry- you'll make it! Make sure to do something super fun and relaxing on your first day back! Looks like you have some great stuff linked up! I am enjoying checking them out!